English Football Club Tottenham Hotspur will be heading to Malaysia for a second post-season friendly game in Asia where the club will be playing against the nation’s football team, Malaysia XI. 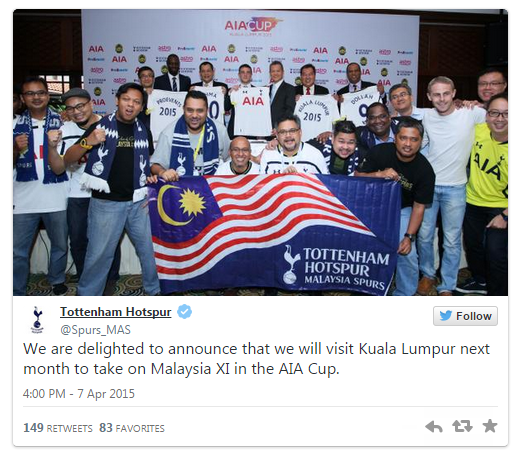 This will be Tottenham Hotspur, or commonly known as Spurs, first visit to Malaysia since 1979. The Premier League club will face a Malaysian select team at Shah Alam Stadium on 27 May, before having another friendly match with Sydney F.C. in Australia, ESPN FC reports. "We are delighted to be visiting Malaysia and are looking forward to giving our fans in that part of the world a chance to see us play up close against some of the best players from their country," said Spurs’ head Coach Mauricio Pochettino in a press release. "We are well aware of the passionate following we have across Asia and the well-established Supporters Club that we have in Malaysia, and hope that we can put on a fantastic show for them on the night as a way of thanking them for the continued support they give us from the other side of the world every week."